This will be the first time I have blogged about tennis which is odd because it’s pretty much the one sport which I’m DEEPLY passionate about. 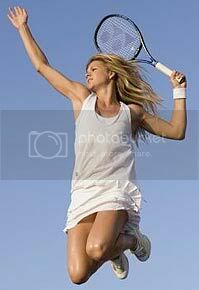 I watch the slams and follow the ATP and WTA tours avidly. Selfishly, I have here my tribute to fashion in tennis since it’s of course Wimbledon time (going to see the semi finals this year!) and we have seen smidges of tennis styling – that lux preppy look all over the S/S06 catwalks. 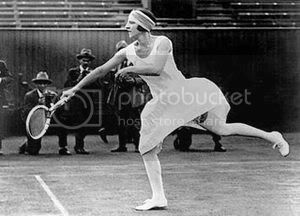 I am particularly interested in the history of women’s tennis fashion in the Wimbledon tournament because there has been some standout players, both in their game and with what they wear. 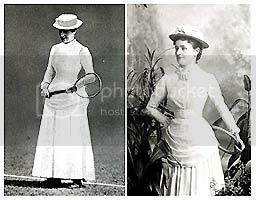 Maud Watson, winner of Wimbledon in 1884-5 caused outrage with her ankle length loose skirts as opposed to the usual floor length ones. 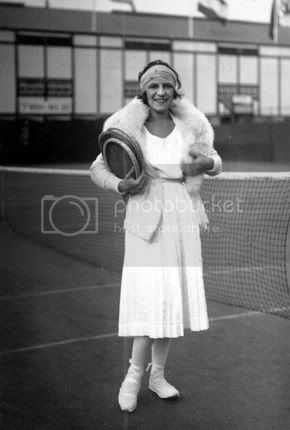 Then the wonderful Suzanne Lenglen came onto the scene after the first world war and really revolutionised women’s tennis fashion. Applying makeup between sets was just the tip of her glamourous image. She wore creations by the French couturier Jean Patou that looked like ballet costumes, all clingy and filmy with brightly coloured cardigans and white silk stockings twisted into place with a French coin. Her trademark was a dramatic bandeau fastened with a diamond clasp and even more extravagant were the fur coats she always wore even during the sweltering heat. 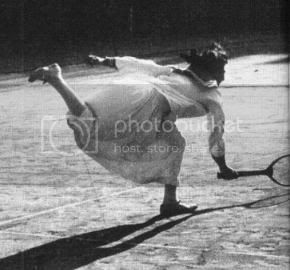 I love the way she strikes a pose with each shot and how her tennis dresses are glamourous but still allow her to move. 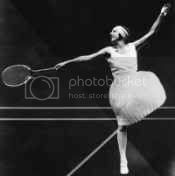 By far, the most graceful and chic tennis player of all time. 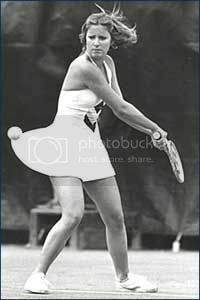 During the 70’s , there were many a tennis fashion disaster but Chris Evert always managed to look great in her Ted Tinling designed dresses. In recent times, tennis fashion has mainly been pretty stale but a few have broken through for their *ahem* interesting fashion choices. 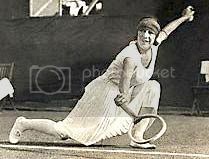 Anne White caused tabloid headlines for her white jumpsuit ensemble at Wimbledon. 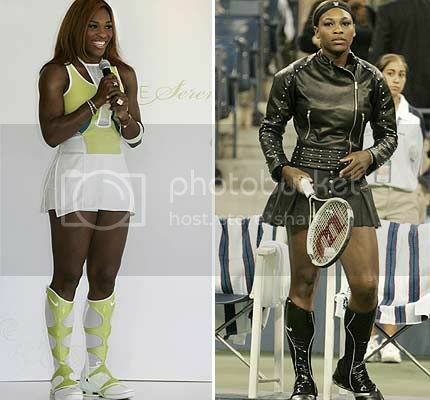 Serena Williams is often slammed/revered for her daring choices. Rarely, does she stick to the ‘all white’ rule at Wimbledon and caused a bit of a sensation with a black catsuit two years ago. This year, Maria Kirilenko, another Russian tennis babe (in the vein of Kournikova and Sharapova) has topped my list of most stylish in women’s tennis sporting the Stella McCartney for Adidas dresses. Kirilenko is actually the muse for the spring/summer collection which probably explains why she looks amazing in the dusky pink dress. I love the very feminine approach to sportswear and tennis is one of the few sports where you can wear a dress and it wouldn’t inhibit your play so why not take advantage of it. Grazia magazine this week, in keeping with the start of Wimbledon has a very moody Match Point tennis-themed editorial. I feel like I have seen this lux preppy look all over the place – the visors in Prada, all the blinding white, luxury polo shirts and as much as unimaginative preppy bores the hell out of me – injecting the look with luxury details like silk dresses and dressier shoes seems like a pretty fine idea. Not a look I would actually wear to play tennis, but hanging around Wimbledon in a similar ensemble eating strawberries and cream will be fab. 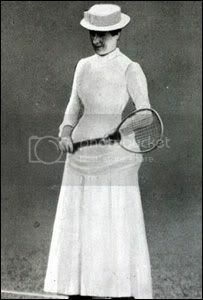 i hope you go more in detail with the history of tennis dresses. i love them. every era. the 60s are a favorite though. Serena Williams in an all black outfit is so intimidating. i love that they are strong women in feminine dresses. Is that the British Vogue? The June volume of the US Vogue also had a Wimbledon-inspired photoshoot. They had a lot of Prada ensemble too, topped with the infamous shade of pink lipstick. Gorgeous, but not very practical. Lisa: Thanks for the link! 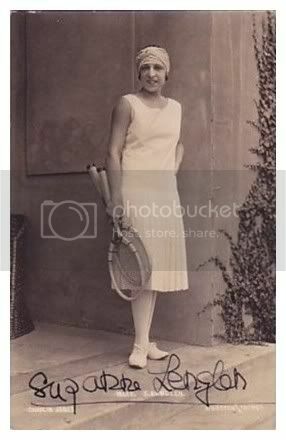 Too bad, they had none of my fave players…..
SwanDiamond: I’m actually more interested in the very early history of Wimbledon attire – I actually even went so far as to root out archive videos at BBC house to watch those old matches with Suzanne Lenglen – so pretty watching her play but very odd to hear it without commentary. Kami: No, i’ts Grazia magazine, a British weekly fashion glossy mag. I’ve seen quite a few shoots like that too. I can’t imagine any tennis player wearing pink lipstick on court – would be cool if one did though, there’s no rules against make-up. I’ve seen them in person and they look pretty swish. Reminds me of 1920’s boating outfits. I would say they still retain a British air, despite being Ralph Lauren. you know you have converted my interest to the earlier costumes. i would love to see the films. those action shots look like stills from a dance. I can’t imagine any tennis player wearing pink lipstick on court – would be cool if one did though, there’s no rules against make-up. Fashion can lay its hands on everything from professions to sports!! , I wonder how they played in those long dresses ! !